Why not just build your own robot buddy out of scrap parts lying around the garage? Building a robot from scratch is not the best place to start. To transform common household items into useful components that actually fit together usually requires a drill press, a milling machine, and a welder. And you’d still have to buy plenty of components that aren’t likely to be lying around the house. The process of building a robot from scratch requires a good design, a healthy dose of knowledge and skills, more time than most of us are willing to commit, and, frankly, a bucket full of money. A better route is to use a robot kit. With a kit, some other poor soul gets to do the measuring, drilling, milling, and design. You get to have the fun of putting together a working robot. It might not be capable of exploring the surface of Mars, but it would be a good springboard for your next project. The most basic starter robotic kits are typically nonprogrammable robots. One good example of an easy-to-use nonprogrammable kit is the Soccer Jr. robot from OWI, Inc., which is shown in Figure 1. 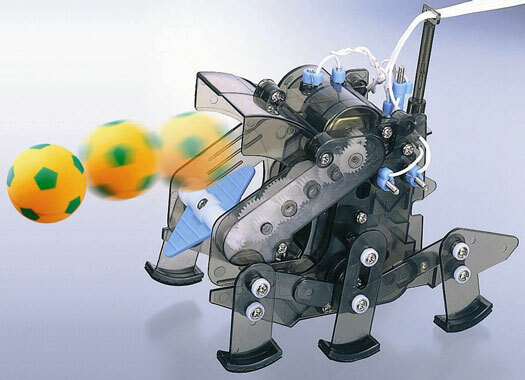 Figure 1: The nonprogrammable Soccer Jr. robot. The little plastic Soccer Jr. robot not only performs a task but also offers some human interaction and control. The kit comes with a wired controller that allows it to move in any direction and capture and shoot small soccer balls (well, they’re actually ping-pong balls). You can even enter it in certain robot competitions. The Hyper Line Tracker, shown in Figure 2, is an intermediate-level nonprogrammable robotic kit from OWI Kit. Unlike Soccer Jr., The Hyper Line Tracker requires no constant human interaction. Instead, it performs one preprogrammed task: following a line. You get to draw the line, which might be more fun than you think. Line following is not a useless task; many industrial robots that manage warehouses use a similar concept to navigate. Figure 2: OWI Kit’s Hyper Line Tracker. When choosing a nonprogrammable robot kit, start with a simple robot that you’re sure you can tackle and then progress to more advanced robots as your confidence and knowledge increases. You’ll know you’ve bitten off more than you can chew when you give up halfway through building a robot. In that case, step back and don’t be afraid to start over and build an easier robot and then come back to the more challenging robot when you’re ready. With basic kits, assembling a robot is similar to assembling a model airplane: You just follow step-by-step instructions, putting the little plastic part A into part B and so on until, voila, you have a finished product. All you may have to do when the construction is complete is insert some batteries and turn the power on. Don’t be deceived into thinking that these robots are just expensive toys. Many are sophisticated and introduce you to essential robotic building principles. Although nonprogrammable kits are simple, they still require basic skills. You may be required to solder parts onto a circuit board, connect wires, and test connections. You may also be required to have some basic building skills such as assembling plastic gearboxes, gluing plastic parts, and bolting parts together. Before you begin, you should review the kit and assembly instructions to be sure that the kit is something you can handle. If you plan to give kits to your kids, you should definitely review the instructions and perhaps even build the robot yourself first. In a few cases, you may find that even a nonprogrammable kit may be more complicated than you expected. Most nonprogrammable robots fall into two categories: remotely-operated vehicles and preprogrammed robots. Essentially, remotely-operated vehicles (ROVs) require human intervention to operate them, and preprogrammed robots don’t. The most basic nonprogrammable robot is the remotely-operated vehicle. The type of vehicle might be controlled by radio signals, a wired tether, or some other means of remote signaling. The Soccer Jr. robot, described earlier, is also an ROV. An ROV such as a radio-controlled (referred to by people in the know as simply RC) car may be robotic in nature, but it is not autonomous (meaning it requires human interaction to do what it does). Because these types of vehicles can’t operate on their own, some robot aficionados are reluctant to call them robots at all and instead refer to them as parabots. The other type of nonprogrammable robot is the preprogrammed robot. Preprogrammed robots are usually autonomous; that is, they require little or no human interaction for them to perform a task. Many preprogrammed robots have a one-track mind. You turn them on and they do one thing, such as responding to a sound or following a line. These robots have one simple task or behavior that they carry out through hard-wired electronic circuits or preloaded computer software. Basically, the designer of a preprogrammed robot makes a decision to not allow the user to modify the behavior of the robot. 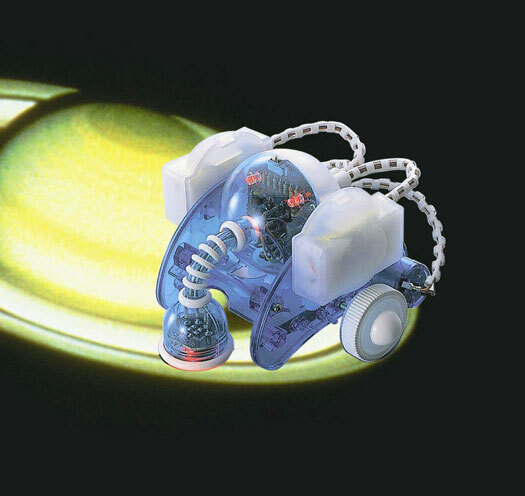 This decision simplifies the robot’s design, as with the Comet robot from OWI, shown in Figure 3, which simply responds to sounds that make it move. With other preprogrammed models, you are allowed to program limited additional functionality. 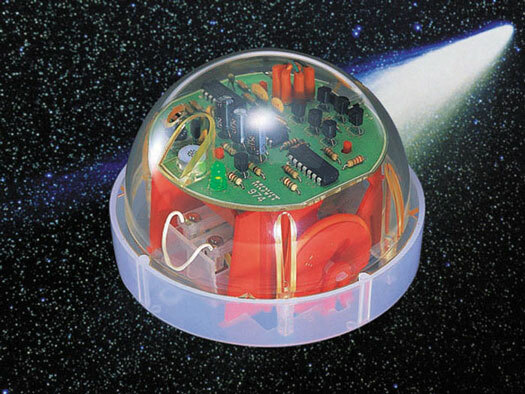 Figure 3: The preprogrammed Comet robot from OWI responds to sound.